It’s that time of year when everyone is writing out their New Year’s resolutions. Unfortunately, many if not most of us ditch our goals by February, if not sooner. I see it every year in the gym. It’s crazy crowded during the first few weeks of January, but it’s a ghost town by Valentine’s Day. 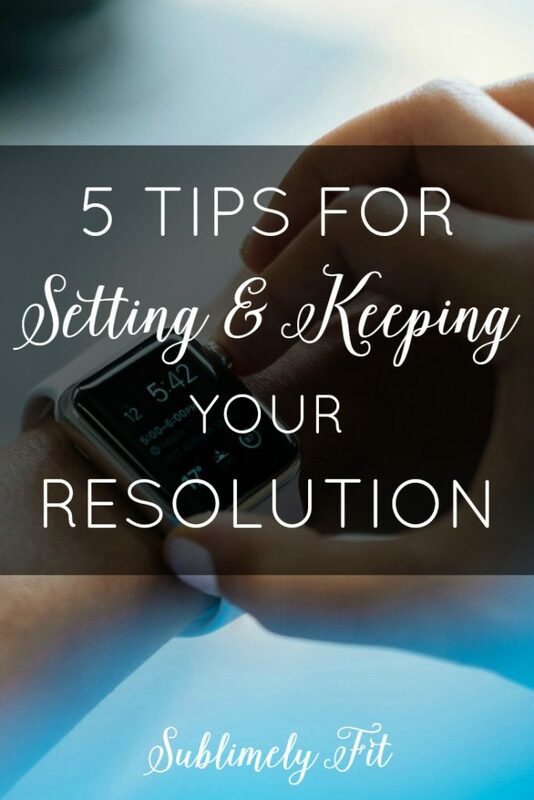 I want to help you keep your resolutions this year, so I want to share five tips for setting and keeping your resolution. You probably heard about SMART goals in school. These goals are specific, measurable, achievable, relevant, and time-bound. There’s a reason why SMART goals have become cliche when it comes to goal making—they work! It’s easier to know how to work toward keeping your goal when it’s a SMART goal. A SMART goal will help you create a plan with action steps to take to meet that goal. 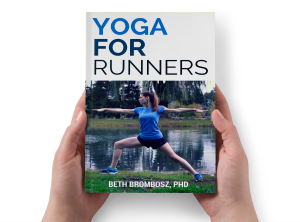 Want to run a 30 minute 5K by May? You can create a training plan to help you get there. Want to start eating 5 servings of vegetables each day? Write up a meal plan to help you stay prepared and on track. SMART goals are your key to success. Once you’ve decided on your goal, I’d strongly suggest writing it down. In fact, write down your goal where you can easily see it. I’m a huge fan of sticky notes, but you could even write a note in your phone that you can look at often. The key is to have a frequent reminder of your goal. When you’re constantly reminded of your resolution, you’ll be more motivated to stay on track. It’s easy to forget about your resolutions when you’re busy or tired or even really hungry. That consistent reminder of where you want to be will help you stay focused on your goal. Do you struggle to keep your New Year’s #resolution year? These tips will help you keep it! Sharing your goals with the people who are most important to you is a great way to stay on track. Find people in your life who you know who will support you on your journey. If you share why your goal is so important to you, they’ll help keep you on track. You might consider letting those special people know what kind of support you need. Do you need tough love? Or just daily encouragement? It’s easier for your loved ones to support you if they know what to do. Are you surrounded by “crabs,” people who love to pull you down? Consider finding support online or in a community group. Even consider starting a blog! One of the big reasons why I started my blog was to document my training for the Chicago Marathon. 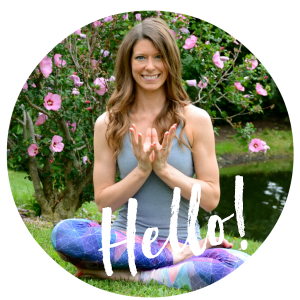 I was training for a PR and I knew if I shared my training, I’d be more likely to stay on track. Even micro-blogging your goals on social media platforms like Instagram can help. Scheduling time to work toward your goals helps you keep them a priority. We all get really busy, and often things like working out or self care are the first things to go. At the beginning of each week or month, take a moment and schedule in the time that you’ll need to work on your goal. For example, when I was training for my half marathon and marathon PRs, I scheduled in every run that I’d be doing as part of my training plan. Having that schedule made it easier for me to get up and run because I didn’t have to think about what I needed to do to reach my goal. I’d already done that thinking ahead of time. When you have to take time to think through what you need to do that day to reach your goal, that’s more time to talk yourself out of it. If you know you need to go work out, it’s a lot easier to go at 6 am on autopilot than thinking about when you want to go. I can almost guarantee you that sleep will sound better than getting to the gym, but you’ll regret that decision later. So, do what you can to make things automatic. It’s easy to skip a workout or binge on junk food for a week straight if you just focus on what feels good at the moment. That’s why it helps to think about why you’ve chosen that resolution or goal. When you can focus on the big picture and the importance of keeping your resolution, it’s easier to stay on track. Has your doctor told you that you need to get in shape? Do you want to cross the finish line of your first half marathon with your best friend? Or, do you just want to have more energy to chase after your kids? Whatever that “why” is, keep reminding yourself of why your goal is so important to you. Do you have any tips for keeping goals or resolutions?